On this special weekend for the Mallory Park circuit, Ben and Tom Birchall hope to help celebrate Mallory Parks 60th Birthday in style. The Mallory Park Bike Bonanza is a late but welcome addition to the RKB F1 sidecar calendar. The date was added to help celebrate 60 years of racing at Mallory park and we can’t think of any better way to spend this coming weekend. Ben and Tom will once again be challenging for top honours in the 600 Cup and will no doubt be having a go at some of the larger 1000cc machines while they’re at it. It promises to be a fantastic weekends racing and a really great weekends entertainment as the sidecars will be joined by all manner of vintage motorcycles and sidecars for what promises to be one of the nicest weekends on the Motorcycle racing calendar. Over the weekend, spectators will get the chance to rub shoulders with some of their heroes from the world of Motorcycle racing. 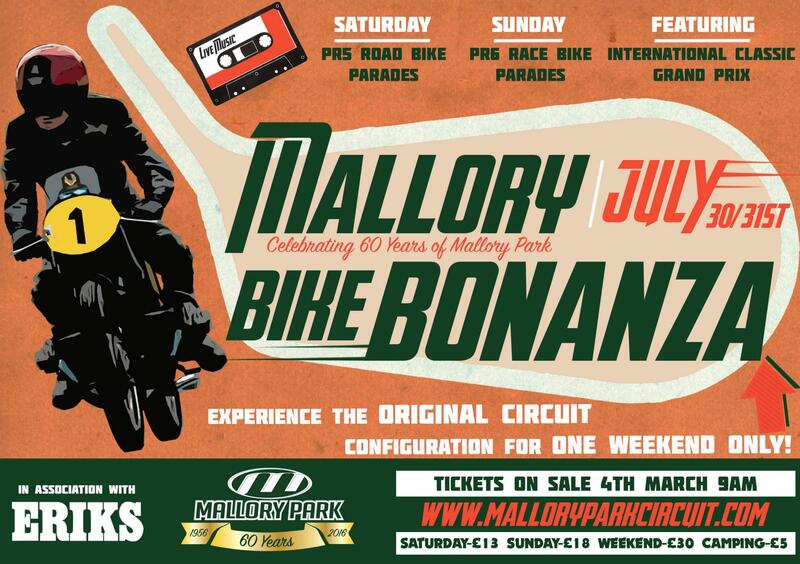 Michael Dunlop (Sunday), Bradley Smith (Saturday), Ian Hutchinson (Sunday), Mick Grant, Alex George, Sammy Miller, Chas Mortimer, Colin Seeley, Ron Chandler, Trevor Nation, Ray McCulloch, Adrian Craig, Stan Woods and Austin Hockley are all lined up to appear this weekend at the Mallory Bike Bonanza. Don’t be fooled into thinking that the friendliness of the people extends to the racing on the Mallory Park track! Mallory is a fast circuit, so fast in fact that a couple of chicanes have had to be added in recent years to slow the bikes down but true to the vintage nature of the weekends events, those chicanes are scheduled not to be in use this weekend. The 1.3 mile Mallory Park Circuit also features a vicious hairpin that demands respect and the seemingly endless Gerrards bend. It’s an intense circuit that’s a real test of skill and always produces close fought and exciting racing. This weekend is the ideal opportunity for Ben and Tom to stretch their lead in the 600 Cup competition before they travel over to Assen in Holland to take part in the FIM Sidecar F2 World Trophy. We love coming down to Mallory Park, it’s such a great place to come and race and we always get a really warm welcome Here. We’re really looking forward to returning to Mallory Park, not only for the racing but also to see all the old bikes and sidecars that will be there. First time at Mallory Park? If you’ve not been down to Mallory Park in Leicester before you’re in for a real treat. Nestled in the heart of the Leicestershire countryside, Mallory Park offers spectators a fantastic opportunity to view the racing from all parts of the track. while not as big as some of the UK’s more well known Circuits, what Mallory lacks in size, it certainly makes up for in stature. The infield has pretty lakes and lush, grass covered hills that form a natural amphitheatre, the perfect place to watch the competitors doing battle out on the track. 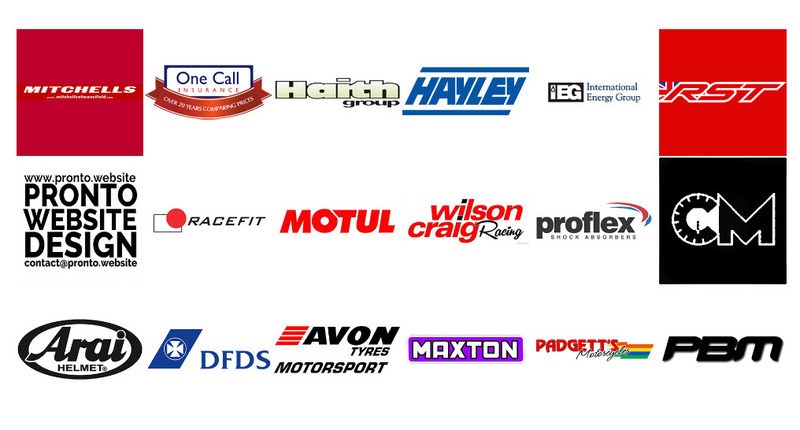 Mallory is known as the friendly circuit and for good reason, the staff are a joy and the facilities are very pleasant. Pop into the cafe down at Mallory Park and you’re in for another treat! This place has almost legendary status in the world of track side catering and it’s not difficult to see why once you pay them a visit. The closest train station to Mallory Park is Hinckley, located just 5 miles away from the circuit. Timetable information can be found here. 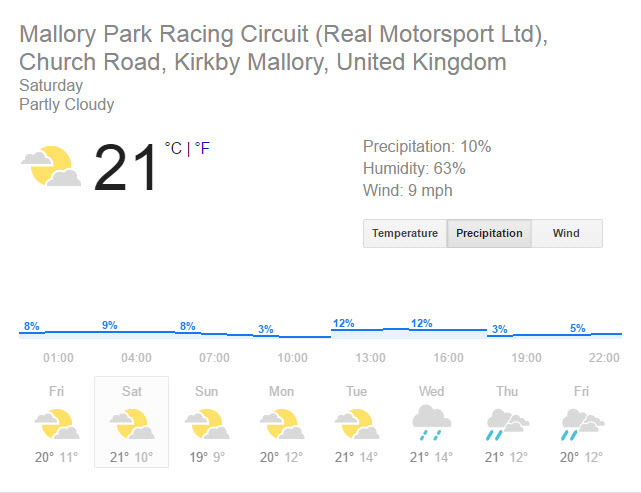 This weekend at Mallory looks to be warm and dry with barely a chance of a shower over the 2 days of competition. With temperatures hovering around the low 20’s Celsius it’s going to be great weather to watch the racing and to help Mallory Park celebrate 60 years of fabulous racing action. Low average wind speeds are also forecast so, it’s looking like a great weekends racing for competitors and spectators alike.